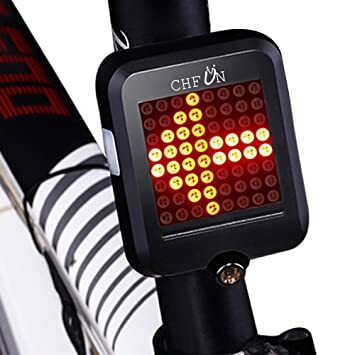 Keep yourself safe on your rides with the CHFUN Rechargeable Bike Tail Light. Attaching to your seat post, this light helps others on the road see you in any conditions. The Bike Tail Light has an intelligent sensor system inside. When you turn, it automatically lights up with an arrow to indicate your direction. In addition, the entire panel of lights will illuminate when you begin to brake. Impressively, the Bike Tail Light produces 80 lumens of light through 64 granule lighting beads. Along with an infrared laser light at the base, these all work together to give information to everyone else on the road. Best of all, the Tail Bike Light requires no batteries. Instead, you can recharge the built-in battery in just 3.5 hours. It will last you 6 hours of use.